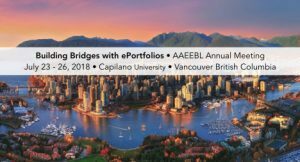 We are thrilled to be hosting the 2018 AAEEBL Annual Meeting here at Capilano University from July 23-26. The 2018 conference will on “Building Bridges with ePortfolios”. Look for further updates on the conference in the coming months!